As nationalist sentiment was rising in the early years of the last century, a new generation of GAA officials emerged who were zealous in their belief in the transformative power of the GAA and they saw themselves as engaged in a project of national liberation. Some GAA tournaments were staged as part of a pro-Boer campaign. Police reports noted: “The ambition it seems to get hold of the youth of the country and educate them in rebellious and seditious ideas,” a somewhat hysterical interpretation of the GAA ban on foreign games. A GAA match in Galway ended with a statement that those present were to unfurl the green flag across the county and “do a man’s part to kill English games among the people”. After 1916, the upturn in militant nationalist sentiment in the country as a whole permeated the GAA, and the possibility of negotiating with the British authorities had vanished. While many of its members fought and died on the fields of Flanders and the trenches of the Somme, the organisation pledged to resist conscription “by any means in our power”. By 1917, the GAA was identifying with Sinn Féin as a potential political force. Across the country, IRA leaders used their GAA connections to recruit people to the IRA. In July, 1918, Dublin Castle ordered that no football or hurling matches were to be played without a permit from the RIC. This prompted open defiance from the GAA which decided to organise August 4, 1918, as ‘Gaelic Sunday’. On that day tens of thousands of people watched hundreds of games throughout the country. The GAA opposition to this order continued as it organised numerous charity games in support of the Republican Prisoners Dependency Fund. As mentioned recently in this column, a Galway hurling team defied curfew and martial law to play a game in Croke Park a week after ‘Bloody Sunday’. At the same time, Republicans set out to disrupt sports which they regarded as being associated with the British Empire; sports such as hunting, horse racing, cricket, golf, tennis, bowling, etc. In Salthill, Republicans dug up the tennis courts, burnt the pavilion to the ground and destroyed a lot of equipment in the tennis club because it was frequented by members of the British army. 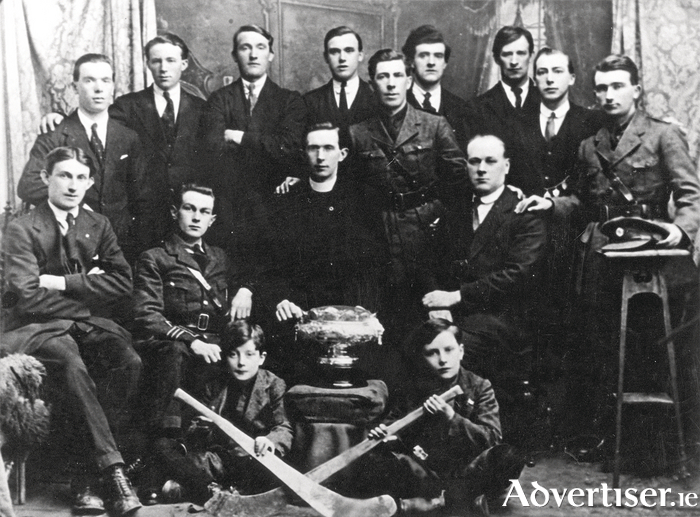 Our photograph today is of the committee of the Galway City Challenge Hurling Cup, 1920. They are, back row, left to right: Tommy Fleming; Paddy O’Connor; John Griffin; Battalion Quarter-Master Seán Turke; A Mannion; P Hurney; Michael John Noone; and Battalion Adjutant M Faherty, Urban Council. Seated are MJ Roche; Commandant Johnny Broderick; Rev Fr EA Mansfield OSA; and J Connolly, Urban Council. The two boys in front are Paddy and Ned Walsh. All of them, except the boys, were involved in the GAA and in the Republican movement at the time. The Challenge Cup was an impressive trophy, but I have not been able to find any record of it being played in competition. In fact it looks very suspiciously like a ‘Galway Challenge Cup’ which was competed for by Senior Fours in the Galway Regatta in 1920. It makes one wonder if the photograph was just a charade, a ‘front’ or a ‘cover up’ for a very serious Republican meeting, in order to fool the authorities. It is particularly interesting because three of the men are in uniform and have military titles. They were officers in the IRA at the time, a time when the IRA used hurling matches and practices as a cover for training and instructing various units and companies of Volunteers in drilling. For example, Johnny Broderick, as the Galway Battalion Commandant, used to cycle to the company areas such as Carnmore, Claregalway, and Castlegar giving drill instructions. The traditional pre-match parade that you see today before big GAA games started off as Volunteers marching around a field holding their hurls as if they were rifles. If you look at the list of places where Liam Mellows’ 1916 Volunteers came from in County Galway, you will see that most of them came from hurling parishes such as Carnmore, Oranmore, Clarinbridge, Turloughmore, Ballindereen, and Athenry. Sometimes the IRA recruited almost entire hurling teams. Seán Turke was at the railway station on September 8, 1920, when a drunken Black and Tan named Krumm produced a revolver and made as if to shoot at the crowd getting off the train. Turke jumped on his back and as the pair wrestled, Krumm’s gun went off and killed a Volunteer named Seán Mulvoy. Another Volunteer then shot Krumm and killed him. The Tans reacted violently, started burning houses and shooting up the town. They tortured and killed Seamus Quirke. They captured two men they suspected of the killing of Krumm, Johnny Broderick and Joseph Cummins. They lined them up at the big sliding door that led on to the platform of the station and shot them. The firing squad must have been either drunk or bad shots because Cummins was shot in the leg and a bullet grazed Broderick’s skull. There was a lot of blood and both feigned death. The Tans left and the two boys went on the run. In 1922, Seán Turke and Johnny Broderick were at the head of an advance party of 30 Volunteers who marched in to Renmore Barracks to take over from the British army as they were leaving. They saluted the English officers as they departed. John Griffin and Paddy O’Connor were well-known Volunteers. Paddy Hurney and Tommy Fleming played on the 1923 County team that won the All-Ireland and Paddy O’Connor also hurled for Galway. Fr Mansfield, an Augustinian, was on the steps of St Joseph’s Church during the funeral Mass for Fr Griffin, repeatedly saying the Rosary in Irish and in English with the huge crowd outside. He was very republican, “a tower of strength to the movement, one of the bravest men in Ireland”. He sometimes delivered IRA dispatches to Dublin and vice versa. The two young Walsh boys were the sons of Mícheál Walsh, a Republican member of the Urban Council who owned the pub known as The Old Malt on High Street. The pub was regularly raided and bombed. His wife was often threatened and warned by the Tans that they were after him. On Tuesday, October 19, 1920, just before 10pm, there were five customers in the pub being served by Mícheál and his colleague Martin Meenaghan. Five men wearing civilian clothes and waterproof coats walked in carrying revolvers in their hands. Two wore soft hats pulled down over their faces, one had something like a red handkerchief covering half of his face. They had English accents. They cleared the pub then took all the money and cigarettes and told Mícheál he would be dead within the hour. They refused to allow him access to a priest, brought him down to Long Walk, shot him in the temple, and dumped his body in the river. The authorities imposed severe restrictions on the numbers of priests and mourners attending his funeral. When his remains were being removed to the Pro-Cathedral, the streets were lined with a squadron of Dragoon Guards with sabres drawn and with a party of armed constabulary. The same happened the following day as the cortege made its way to the New Cemetery. An armoured car followed the funeral. Much of the above information is drawn from Paul Rouse’s wonderful book Sport & Ireland, A History, and we also thank An t-Ollamh Gearóid Ó Tuathaigh for his help.